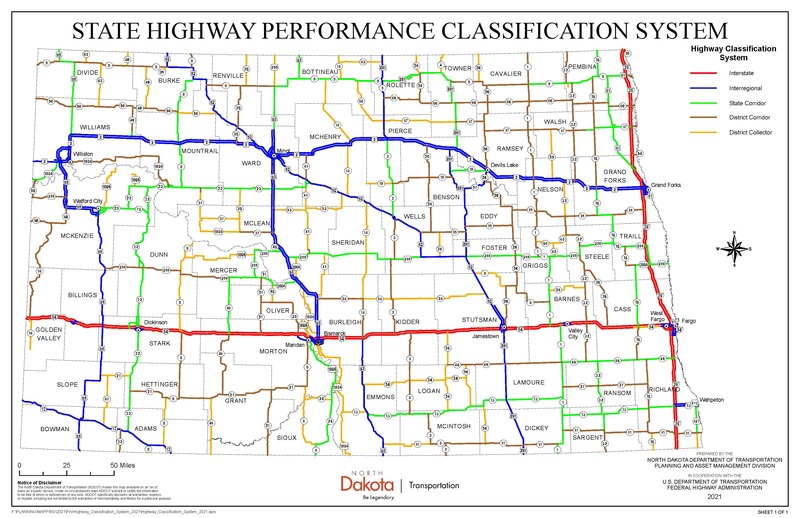 The Highway Performance Classification System is subject to periodic change based on variations in traffic and trade patterns, public input and final acceptance by NDDOT management. For a larger view click on map below. Maintaining a high degree of reliability and mobility on these highways is critical to support and promote international, national, regional and statewide trade and economic activity. Movements are primarily long-distance, interstate and intrastate traffic. Rural Interstates are multiple-lane (usually four) facilities and have full access control. The goal is to be free of height restrictions and provide for the unrestricted movement of legal loads. Ride and distress scores are generally in the good to excellent categories. High volumes of traffic, as well as a high percentage of trucks, are relatively consistent year round. Travel speeds average 65 to 75 miles per hour. Rural Interstates demonstrate a high degree of safety with crash rates below the statewide average. Maintaining a high degree of reliability and mobility on these highways is critical since they support and promote international, national, regional and statewide trade and economic activity. Movements on these highways are primarily long-distance, interstate and intrastate traffic. Interregional System highways are either two-lane or multiple lane facilities. Segments or specific locations may have partially controlled access. The goal is to be free of height restrictions, provide for the unrestricted movement of legal loads, and have limited passing restrictions. Accommodating truck traffic is a priority. Ride and distress scores are generally in the good to excellent categories. Moderate to high volumes of traffic, as well as a high percentage of trucks, are relatively consistent year round. Daytime travel speeds average 60 to 70 miles per hour. The Interregional System demonstrates a high degree of safety with crash rates below the statewide average. Maintaining a moderately high degree of reliability and mobility on these highways is critical since they support the movement of agricultural commodities, freight, and manufactured products within the state. State Corridors provide connectivity between lower and higher level roadways. State Corridors provide connectivity between lower and higher level roadways. Movements on these highways are primarily medium-distance intrastate traffic. State Corridors are typically 2-lane facilities and have segments or locations with partially controlled access. These highways have either paved or aggregate shoulders, some segments may have limited passing zone restrictions, and load limits are restricted by legal weights. Bridges and overhead structures provide for the unrestricted movement of legal loads. Ride and distress scores are generally in the good category. Moderately high volumes of traffic are relatively consistent year round. Daytime travel speeds average 60 to 65 miles per hour. State Corridors demonstrate a moderately high degree of safety with crash rates less than the statewide average. Maintaining a moderate degree of reliability and mobility on these highways is desirable. Movements on these highways are primarily short to medium distance intrastate traffic. District Corridors are two lane facilities. Generally, access control is not purchased. These highways have narrow paved or gravel shoulders, segments with restricted passing zones, and may be restricted to 8 or 7 ton seasonal load limits. Bridge structures provide for the unrestricted movement of legal loads. Ride and distress scores are generally in the fair and good categories. Moderate volumes of traffic are relatively consistent year round. Occasional increases in seasonal traffic volumes and truck movements occur. Daytime travel speeds average 55 to 65 miles per hour. District Corridors are safe highways with crash rates at or near the statewide average. Maintaining reliability and mobility on these highways is a lower priority. These highways are generally short routes that provide connectivity to the higher road level systems. Movements on these highways are primarily short distance, local, farm to market traffic. District Collectors are two lane facilities. Generally, access control is not purchased. These highways generally have no shoulders. Segments with restricted passing zones exist. Seasonal load limits of 7 or 6 tons are normal although some segments may have year round load restrictions. Bridge structures provide for the movement of typical legal loads. Some structures have load, height, and width restrictions. Ride and distress scores are generally in the fair category. Low volumes of traffic are normal year round. Small increases in truck movements may occur during spring planting and fall harvest periods. Daytime travel speeds average 50 to 55 miles per hour. District Collectors are safe highways with crash rates near the statewide average.